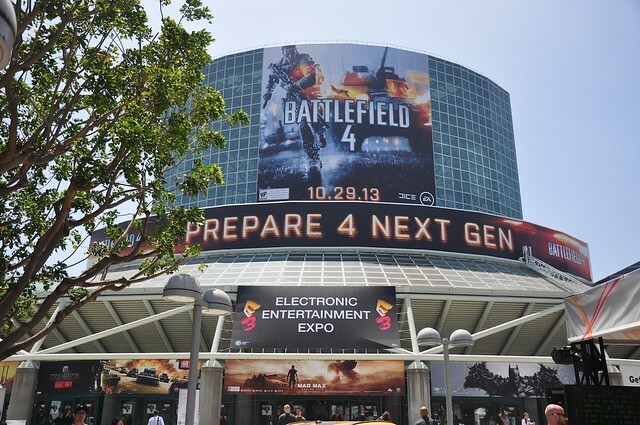 This week was the annual mecca of video games that is the Electronic Entertainment Expo, or E3 for short. 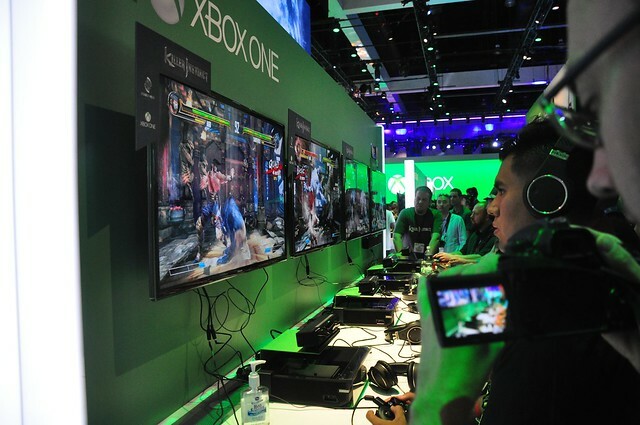 E3 2013 brought gamers and developers together from around the globe to the Los Angeles Convention Center for a four-day geek-fest of all things pertaining to gaming. New consoles, games, accessories, and more were debuted, sparking massive huzzahs and debates from the electronic gaming community. 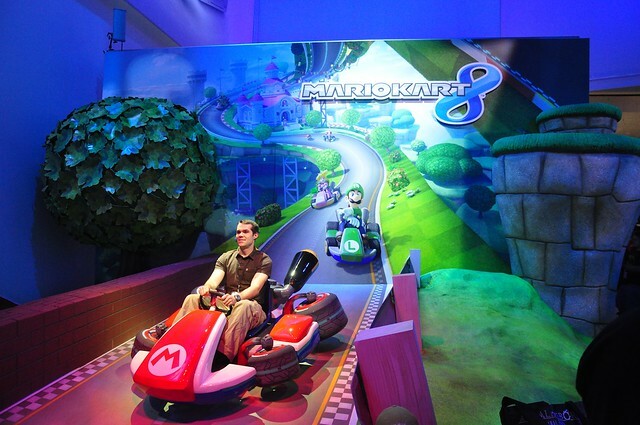 My brother Josh and I scoured the halls of E3 in search of anything Disney and this year the Mouse house commanded some of the biggest attention across multiple platforms. 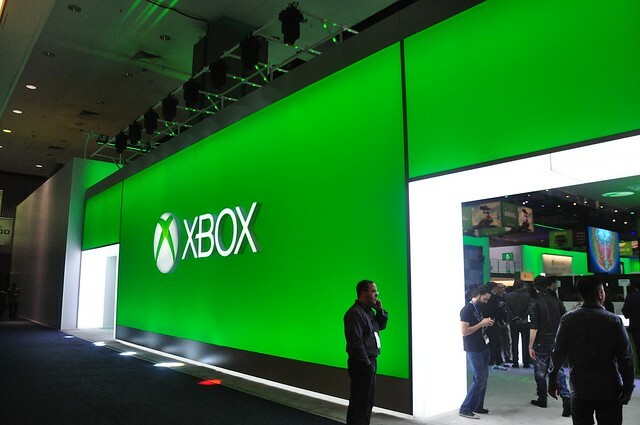 But Disney definitely wasn’t the only company making big headlines, with attention firmly focused on the upcoming new consoles from Microsoft and Sony as well as plenty of other exciting game developments. 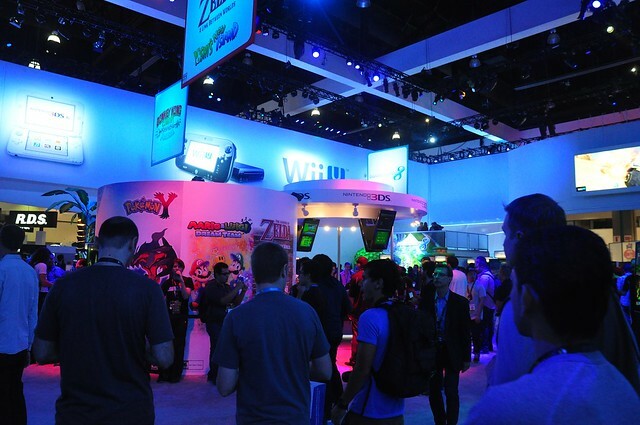 Before we dive into the specifics, take a tour of the massive E3 2013 show floor. 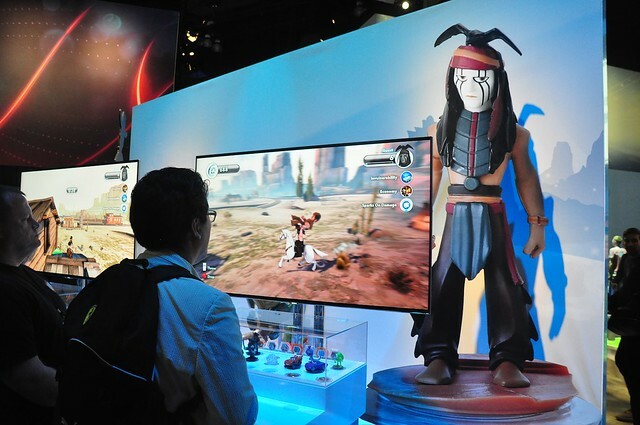 Our first and primary focus at E3 was to follow up on Disney Interactive’s most ambitious video gaming venture to date, Disney Infinity. 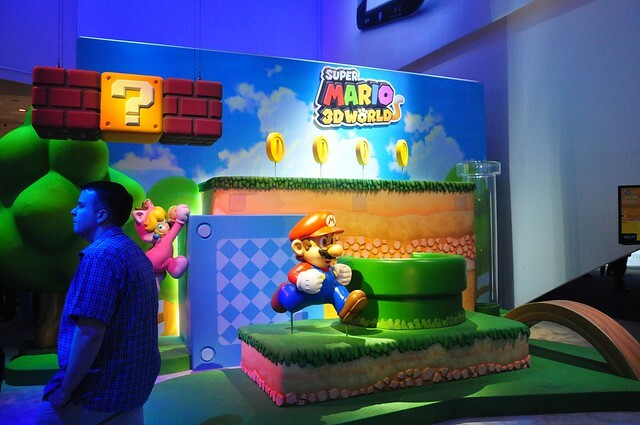 We’ve been following the game since before it was first announced, eagerly awaiting its August release. 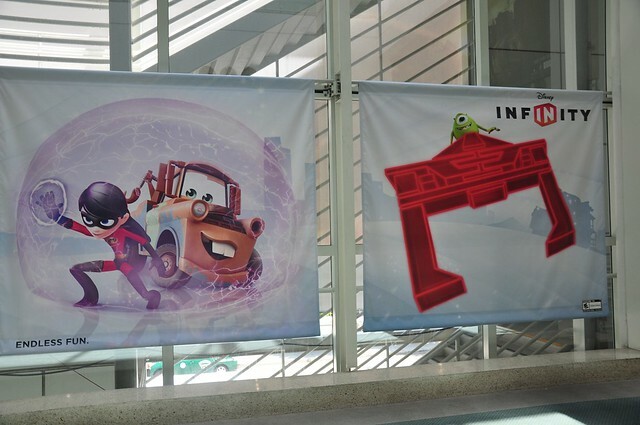 Banners promoting Disney Infinity lined the paths leading to the show floor, ensuring every attendee’s attention was captured. 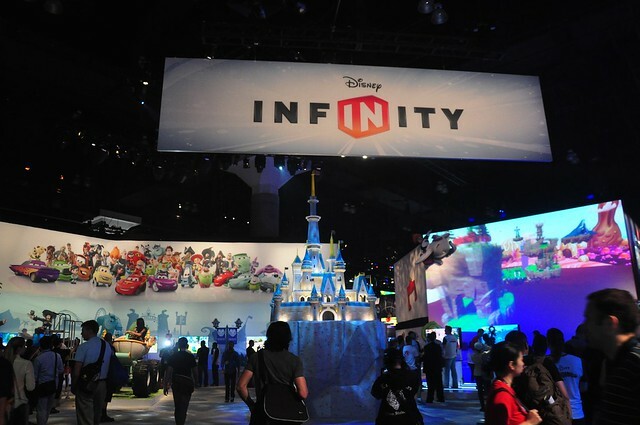 The open-air Disney Infinity “booth” had one of the biggest footprints on the E3 show floor. 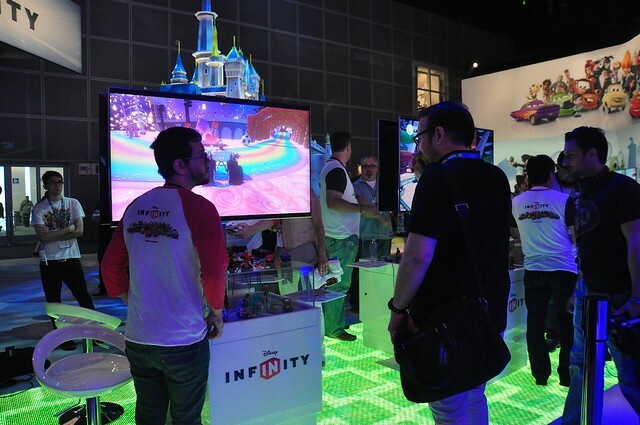 They were pushing Infinity hard with customizable T-Shirts and figure giveaways, a photo-op in Cinderella’s carriage (complete with monster truck tires), and plenty of consoles offering a chance to get hands-on with the game. 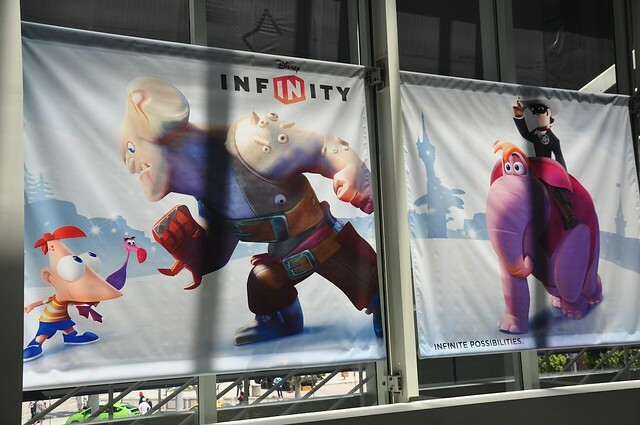 While demoing the game, we chatted with several people from Disney Interactive about what’s new for E3 in the world of Disney Infinity. Topics included the newly-introduced “The Lone Ranger” play set and possibilities of integration with Disney’s theme parks. Learn more in the video below. There wasn’t too much new information offered that hasn’t already been heard about the game but we did find out there are plans for exclusive merchandise to be sold in the Disney parks. They hinted at exclusive discs, possibly figures, to be sold within the theme parks, unlocking locations like Cinderella’s Castle or even The Haunted Mansion, perhaps available only to purchase at their respective real life locations. Disney Parks and Resorts chairman Tom Staggs also recently hinted that Disney’s forthcoming MagicBands may also work with Disney Infinity, but nothing has been formally announced. There still isn’t any word on the mobile version of Disney Infinity, which was promised back at their press event announcing the game several months ago. Those details are being worked out. The lines to get the free E3 swag from Disney were fairly long. By Thursday, word of mouth had gotten around and people were waiting several hours for a chance to get a free t-shirt and action figure. We waited for an hour and gave up. But we still might get a shot at that shirt as there was some indication that Disney Infinity will have a presence at this year’s San Diego Comic-Con next month and almost definitely at the D23 Expo in August. 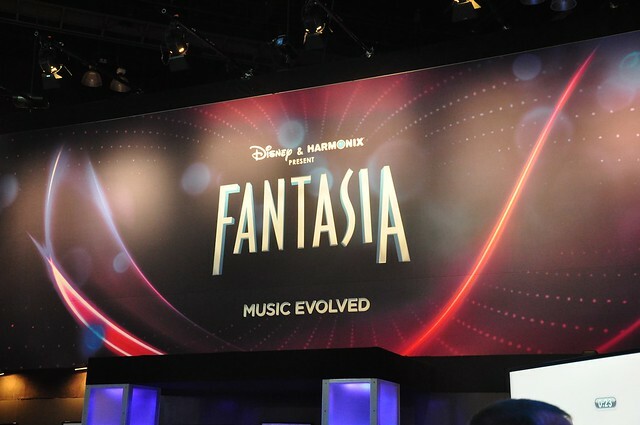 Fantasia: Music Evolved is kind of like a dancing game in the vein of Dance Central or Just Dance but it’s more like conducting an orchestra. Or, an even better example, it’s like the final moments of Fantasmic at Disneyland where Mickey is making fireworks shoot up in the air synchronized to the music. That’s my favorite part of the show and in that regard, this game works. But I’m not sure how long that novelty will last, though it will be fun to play around with. 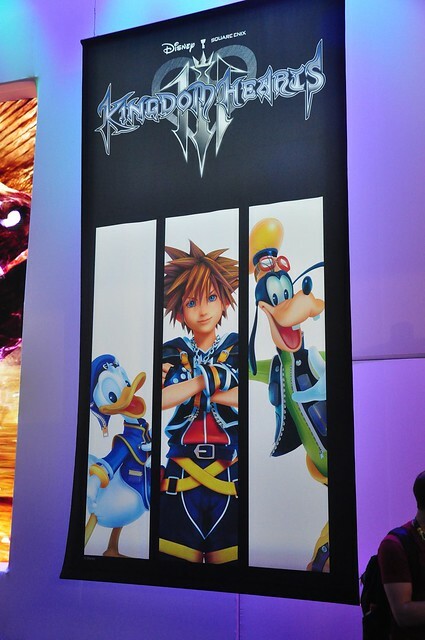 Big news at E3 2013 for Disney fans was the announcement that Kingdom Hearts 3 is finally on its way. We stopped by the Square-Enix booth to try to find out more but they’re not ready to talk just yet. It’s too far out in development for them to release anything but poster art and a teaser video. 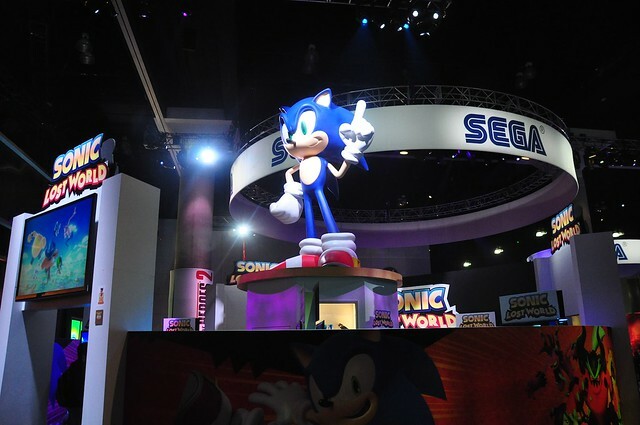 SEGA had a booth at E3 2013 with a giant Sonic the Hedgehog towering over his domain. He was promoting his own new game but that wasn’t what we were there to see. We were looking for Castle of Illusion starring Mickey Mouse, a new platformer inspired by the original SEGA Genesis game. We had a chance to play the game, which features beautiful visuals and gameplay as good as most 3D platformers out there. We also spoke with SEGA’s producer of Castle of Illusion, who stressed this isn’t a port of the classic game but a brand new game inspired by the original. 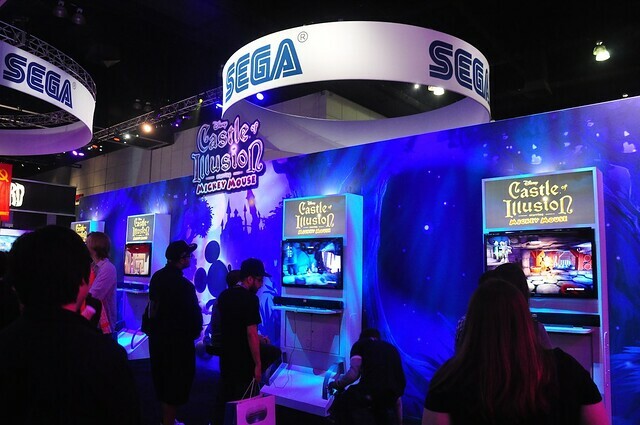 Castle of Illusion starring Mickey Mouse will be released this summer for Xbox 360, PlayStation 3, and Windows PC. EA dropped a huge bomb on everyone by casually and unexpectedly showing a teaser for a new, next-gen Star Wars Battlefront game during their press presentation on Monday. Nobody saw it coming. 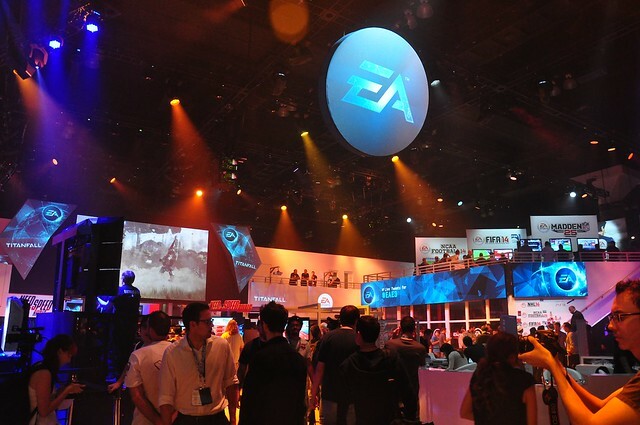 The game is still a long way from release so naturally EA was not willing to provide any more information during the show. But now we Star Wars fans have something else to wait impatiently for, in addition to the new films. 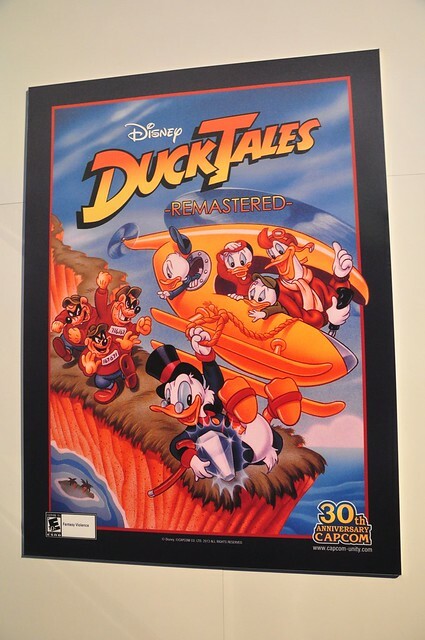 Capcom had a booth promoting Ducktales: Remastered, showing off their newly-revealed Amazon and Transylvania levels. 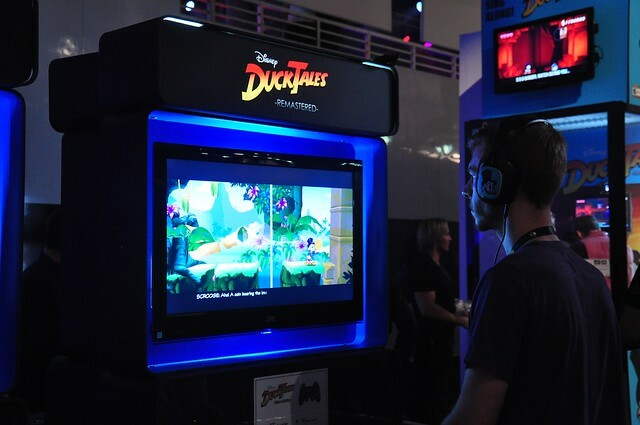 There was also a karaoke booth where attendees could sing the famous “DuckTales” theme song (Woo-oo!). 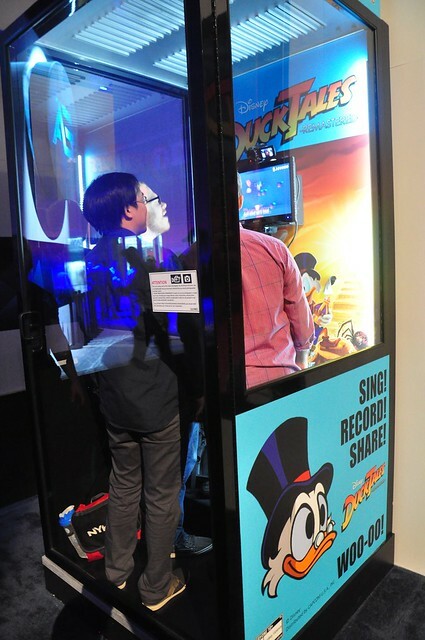 Elsewhere in Los Angeles, at the iam8bit Entertainment System art gallery, Capcom built a real life replica of Scrooge McDuck’s money bin for photo ops, also promoting the game. 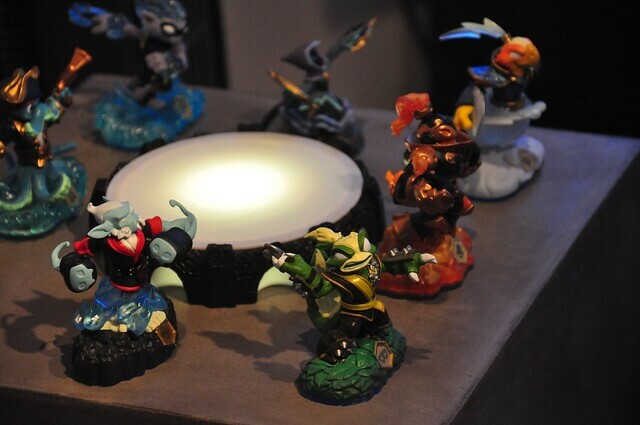 Disney Infinity’s biggest competitor is Activision’s Skylanders. 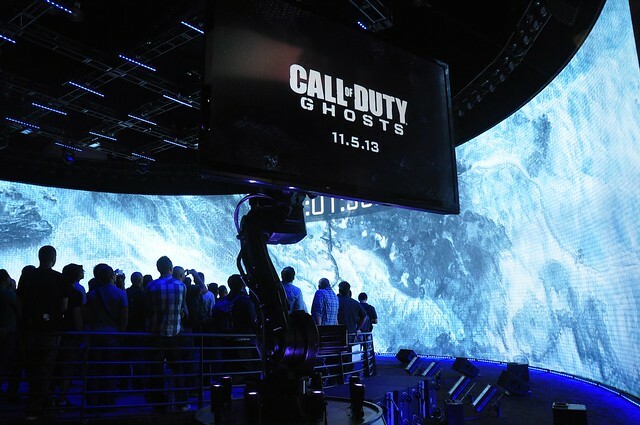 (Or, perhaps, Disney is Activision’s newest competitor.) 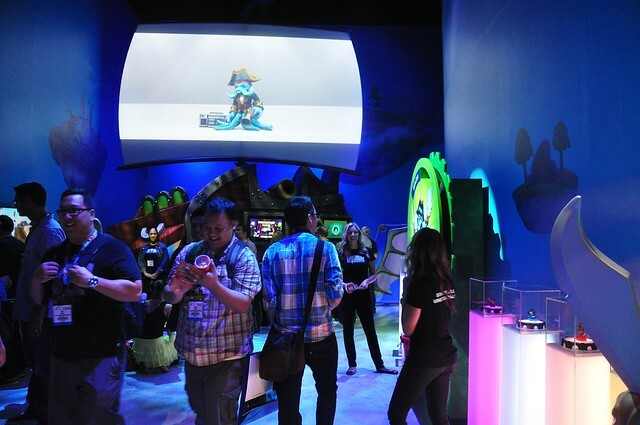 The Skylanders portion of Activision’s booth wasn’t terribly large, but did attract plenty of attention to their upcoming Skylanders Swap Force game with an action figure give-away (exclusive to E3). 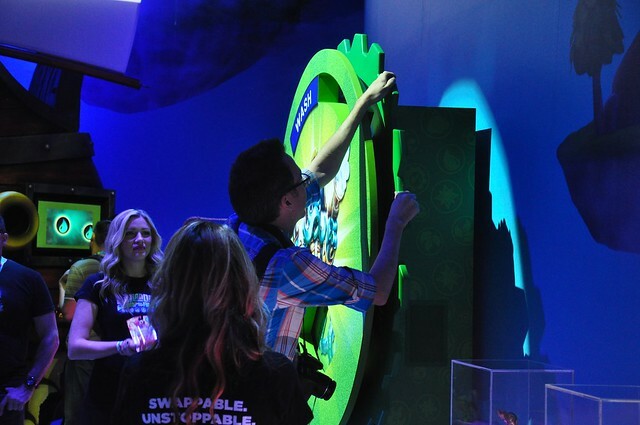 Attendees had to spin a wheel and try and line up a picture to win the prize. There was no skill involved, like spinning “The Price is Right” wheel. You had a pretty good chance of winning but Josh and I both did not. We waited in a long line for an hour and came away empty handed and grumpy about it. On that end, Disney won, just because you were guaranteed to walk away with the swag you were waiting in line for at their booth. 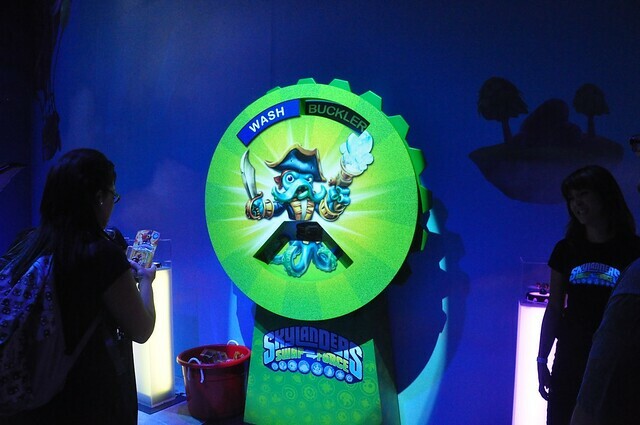 Goodies aside, we attended a rather lengthy demo of Skylanders Swap Force, following up with questions. 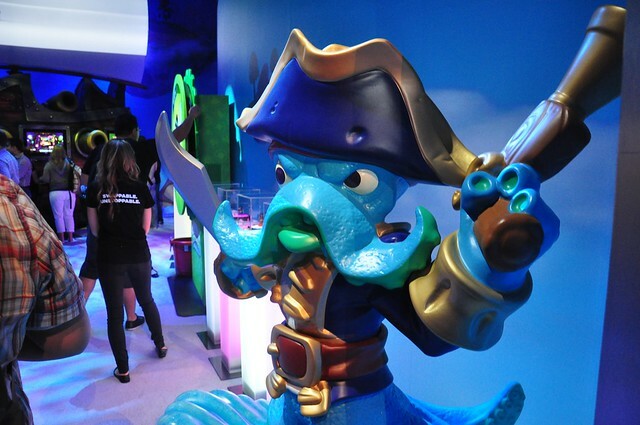 When asked about Disney Infinity’s huge presence at E3, Activision said they welcome competition – but quickly changed the subject, focusing on their newly introduced swappable Skylanders characters. Activision keeps coming up with clever characters to continue the Skylanders franchise well into this year’s release, but Disney is definitely hot on their heels with more recognizable faces from across their many properties. Comparing the movie-based play sets of Disney Infinity to the basic gaming of Skylanders, the two are quite similar, but the overall games definitely aren’t the same, with Disney Infinity’s Toy Box mode offering an entirely different method of play. Skylanders will certainly continue to thrive, especially after releasing their new Swap Force characters, but Disney fans will surely turn their attention (and wallets) toward Disney Infinity. Activision did have a large presence at E3, not only promoting Skylanders but also Call of Duty: Ghosts, Diablo 3, and Destiny. 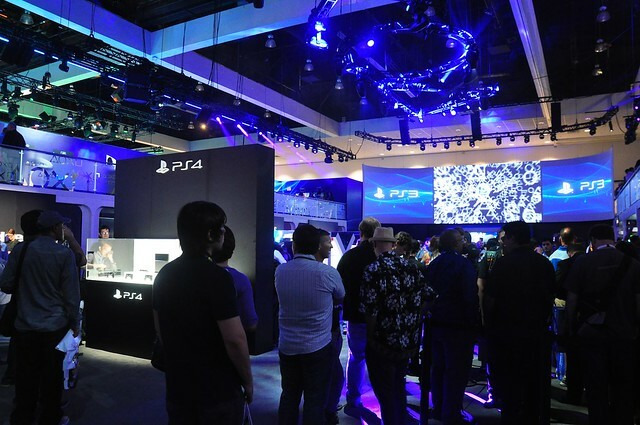 This year, the biggest news everyone on the convention floor was talking about was the PlayStation 4 versus Xbox One. No matter where you went, someone was giving their take on the issue, with both units on display at their respective booths. 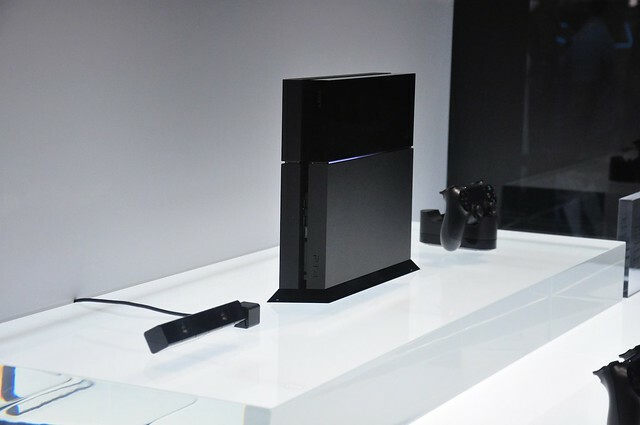 The scuttlebutt on the Internet and throughout E3 is that the PS4 is the winner of this generation’s console battle. Sony’s price is $100 lower and players can share games with friends, while the Xbox One has many overbearing restrictions. 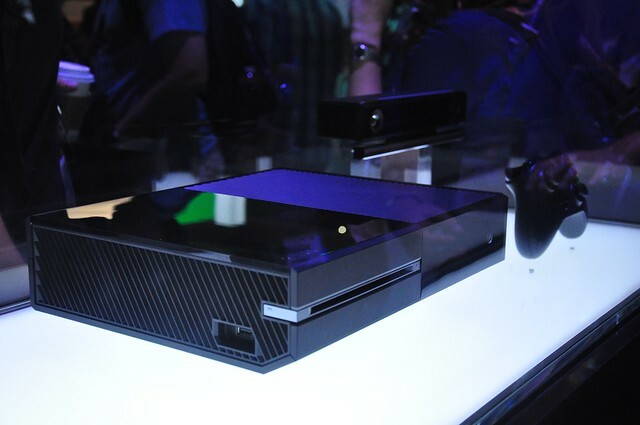 Plus conspiracy theorists don’t like that Xbox One is always on and “watching you” through its Kinect system. 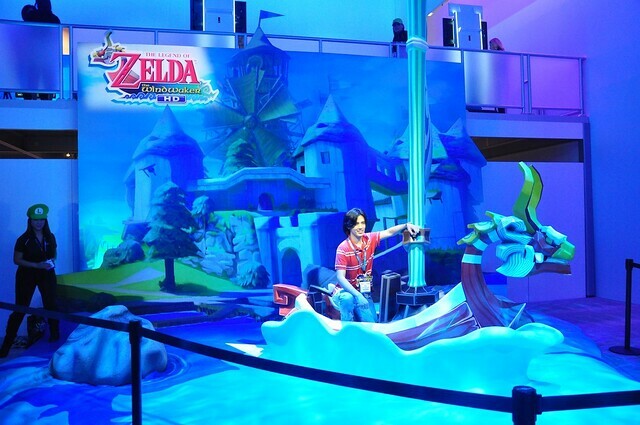 Meanwhile, Nintendo didn’t have any big announcements for E3, but did offer a fun area with a lot of hands-on gaming and colorful photo opportunities, including Super Mario 3D World, Mario Kart 8, Donkey Kong Country, and The Legend of Zelda: The Windwaker HD. 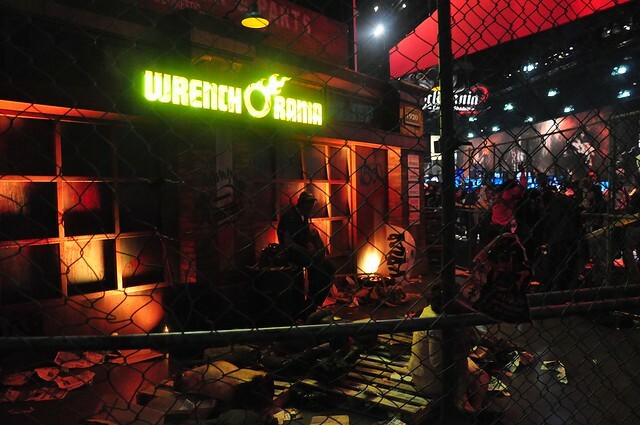 Capcom’s Dead Rising 3 also had an elaborate impressive area – featuring live zombies! 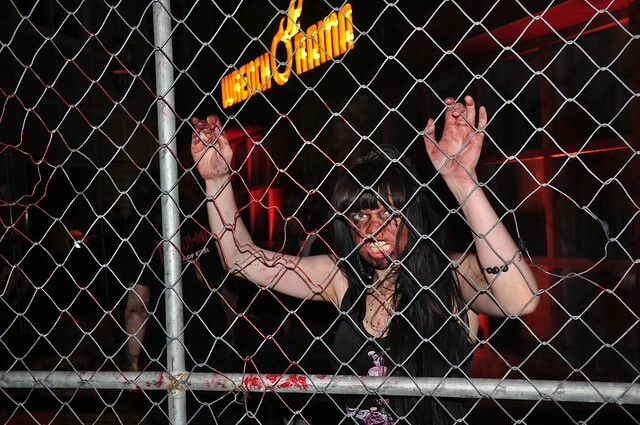 And let me tell you, zombies are scary in real life. I know (hope?) they were actors, but I kept my distance. 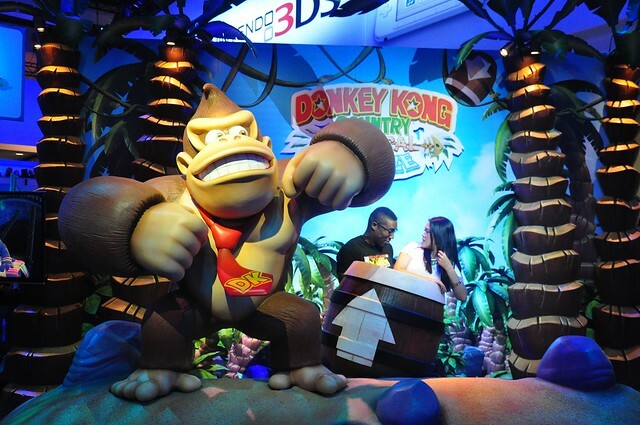 But what impressed us most at E3 2013 wasn’t even on the show floor. It was in a meeting room upstairs and out of the way. 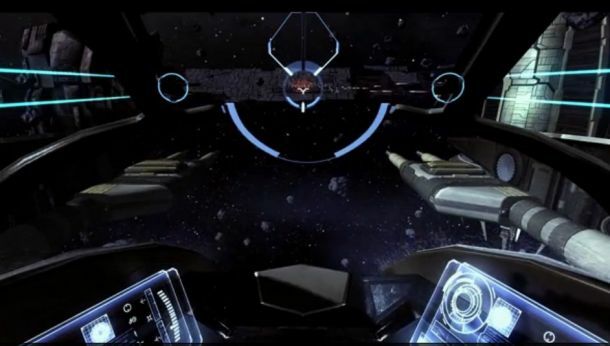 A game developer called CCP, famous for EVE Online and Dust 514 was there showing off a new piece of tech still in development called the Oculus Rift. They had designed a brand new demo game called EVR, a space dogfighting game similar to the old X-Wing and Tie Fighter games from LucasArts. It’ll never be sold, created just to show off Oculus Rift. 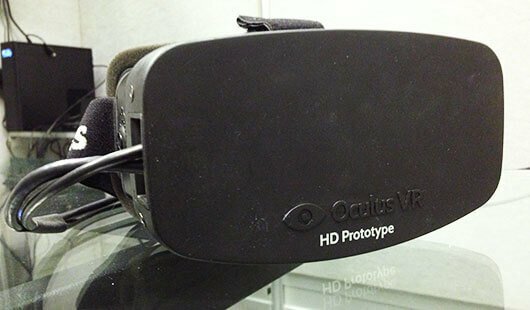 The Oculus Rift is an immersive 3D Virtual Reality head mount. Before you scoff and make some comment about the final scene of Disney’s Carousel of Progress, this thing was fantastic. It’s a real game changer. I could look around in every direction. If I looked down, I saw my body in a space suit, sitting in a spaceship cockpit. Doing barrel roles and turning too quickly gave me the same sensation I would have in real life. I’ve never had such fun playing a game. And if they had the mount ready for purchase, I would have easily plopped down $500 on my way out the door. Forget the PS4 or Xbox One. Give me Oculus Rift! 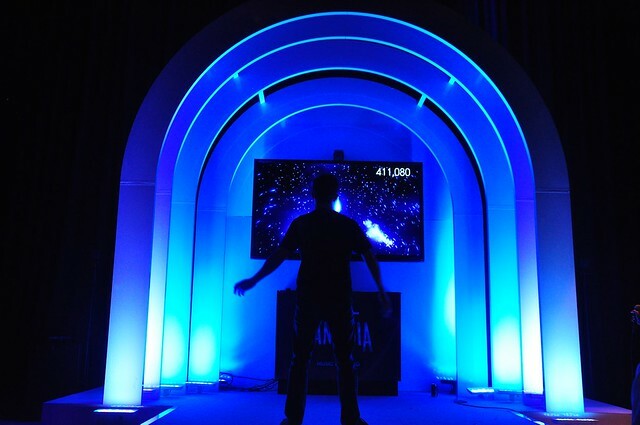 So that was E3 2013. I couldn’t help but feel that Disney Infinity was a little out of place. 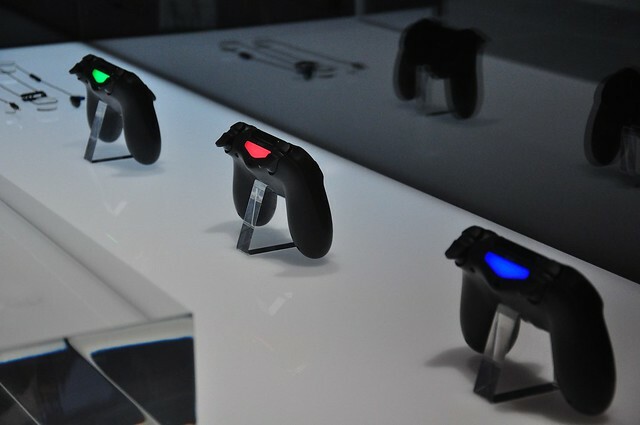 Most games were pushing the envelope either in story, technology, or gameplay (and much darker). Disney Infinity is impressive with its elaborate Toy Box mode, but it wasn’t what most people at the event were talking about – except us die-hard Disney fans. Josh and I already have Disney Infinity pre-ordered. (You can too.) 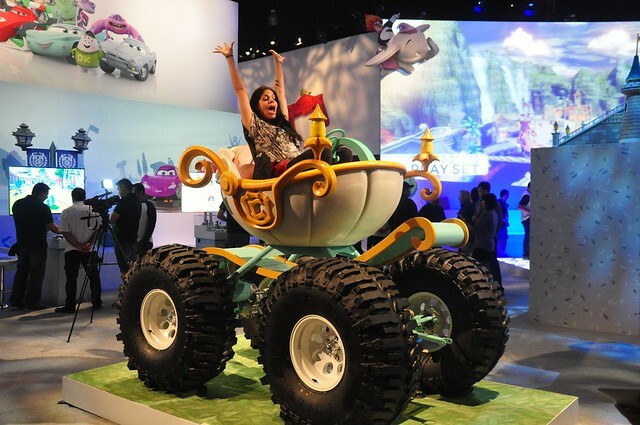 And the Cars play set we received as swag from Disney’s E3 booth will be the first one I play when it’s released. California filmmaker and co-director of the Missing in the Mansion short film set inside Disneyland's Haunted Mansion. I still don’t get why Kingdom Hearts, which has always been a PS exclusive, is now coming to XBone and not the WiiU. Neither is Castle of Illusion for that matter. Very disappointing. Welcome to the world of being a Nintendo fan 🙁 Buy hey, Ducktales is coming to the Wii U. So keep your chin up! Because graphically, the WiiU is not as strong as the PS4 or the XboxOne. That’s not me being mean, the WiiU is a wonderful console, but it’s just a fact that it wasn’t meant for “intense gaming” if that makes sense? Even though the PS4 is more powerful than the XboxOne, their specs are almost entirely the same, so it is easier to develop for both. And just as a side note: of the seven KH games currently out, FOUR of them are on Nintendo devices: Chain of Memories (GBA), 358/2 Days (DS), ReCoded (DS), and Dream Drop Distance (3DS). I would say that most of Disney’s target demographics purchase Nintendo consoles, which is why most Disney games come out on them. As long as they keep making Smash Bros., Nintendo has my money. 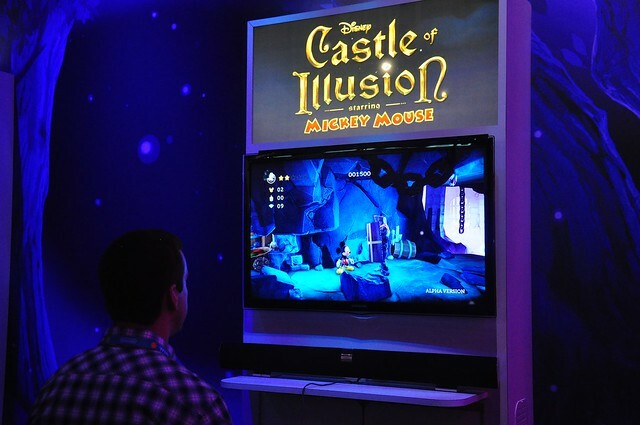 Now that I know Castle of Illusion is an entirely new game, I am a little more excited for it. Sega has done a terrible job of communicating that to the public. You have touched ssome pleasant factors here.